The incident of veteran stage actor facing an accident recently was flashed across many media. Having attended a radio programme early dawn last 28th and when returning home Ravindra's vehicle has crashed into a Kumbuk tree on Kesbewa Road, Bandaragama in Gammanpila, Kamburugoda area. 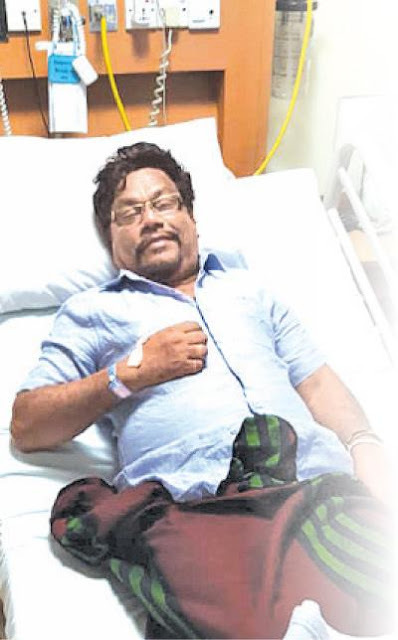 The villagers had got together and admitted him to Horana Hospital. leadership of Sarath Fonseka. Ravindra has told a weekend newspaper that the accident took place when he had tried to avoid a Kalvedda (wild cat). "I had finished the programme and I was on my way home. At Kamburugoda an animal ran across the road. As far as I remember it may have been a big wild cat. In order to save the animal I veered the vehicle to the side of the road. Simultaneously in the most unbelievable manner the vehicle slipped and with the same speed I was travelling in it went and struck a Kumbuk tree. I spoke to my home-people and told them of the incident. In a couple of minutes the ambulance came. At the time the Kaamburgoda took me to hospital I still was quite conscious. I asked what should be done to my jewellery. I asked them to keep the jewellery with them. All that was kept safe and intact. Therefore I should thank all of them. From the time I was admitted to Horana Hospital, every minor employee onwards paid great attention on me. Particularly the doctors saw to it that every test was carried out and I was treated well. I owe my thanks to all of them".